The tectonic plates o the warld wur mapped in the seicont hauf o the 20t century. 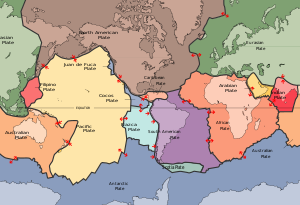 Plate tectonics (frae the Late Laitin tectonicus, frae the Greek: τεκτονικός "pertainin tae biggin") is a scienteefic theory that describes the lairge-scale motions o Yird's lithosphere. The model builds on the concepts o continental drift, developed during the first few decades o the 20t century. The geoscientific community acceptit the theory efter the concepts o seafluir spreadin wur developed in the late 1950s an early 1960s.